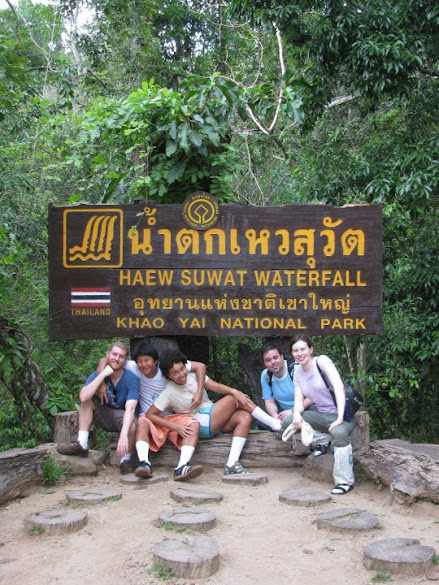 Mark organized a meetup trip to Khao Yai National Park. There were some new “weekenders” this time. We all met up at the Mochit bus terminal then got on the next bus to Pak Chong. From Pak Chong we took a songtow to an entrance to the park. The fee to enter is 40THB, if you are Thai or have a work permit. Other wise the cost is 400THB. Since my company is not really on the ball when it comes to doing paperwork in a timely fashion, neither Mark nor I have work permits yet. We are still in the “process stage” of being legal workers in Thailand. I’m just a few tedious steps from getting health insurance. Mark is a couple of steps behind me, since he changed schools. I might be employed in Japan by the time I get my work permit for Thailand. From the gate we started to walk toward the campsite. We could have rented a private songtow to take us in, but we didn’t know. We took a public songtow to the entrance instead. Public transportation vehicles are not allowed to enter the park, only privately hired vehicles. If we called for a car, truck, or whatever to come pick us up, there is no telling how long we would have had to wait. Besides, this was a great opportunity for John to fulfill his life long dream of hitchhiking on every meetup trip. After we set up our tents we went for a walk along the road towards some waterfalls. It was a cobra-free, yet leech infested walk. We didn’t realize it at the time, but we had almost walked to the nearest waterfall. There were monkeys relaxing on the side of the road and they stole our attention. Within seconds we all forgot or lost interest in the waterfalls. Later, after the sun had set, boredom took hold of us. There was really not much to do. We were under the impression that fires were not allowed at the campsite, though no one could say where this idea came from. Our plan of action was to get some flashlights and head off in the jungle to see what the waterfall looked like in the pitch dark of night. I think it was John that suggested it and no one really protested too much, at first. The protests came after we were deep in the jungle and when they popped up, they were ignored until the vote to head back became unanimous. As you’ve probably guest, I was leeched upon. We all were. Those tiny blood suckers where everywhere! For reference if you find a leech sucking your blood, the leech entry on wikipedia.org recommends picking them off with your nails, pinching at the head of the leech. Make sure to clean the wound, put on a band-aide, and don’t worry, for most people leech bites are far from serious. Salt, for a leech that is on you and sucking your blood, is not a good idea. According to wikipedia.org, it just makes them vomit. You don’t want a leech that is attached to you to vomit into your wound. Everyone stop for a leech check! The next day we did one more trek into the jungle to see some water falls. It took a long time to get there. After the previous night’s leech attacks we stopped every 15 minutes to do a “leech check”. These inspections, which required a leech buddy to look at your feet and ankles, did not prevent bites. 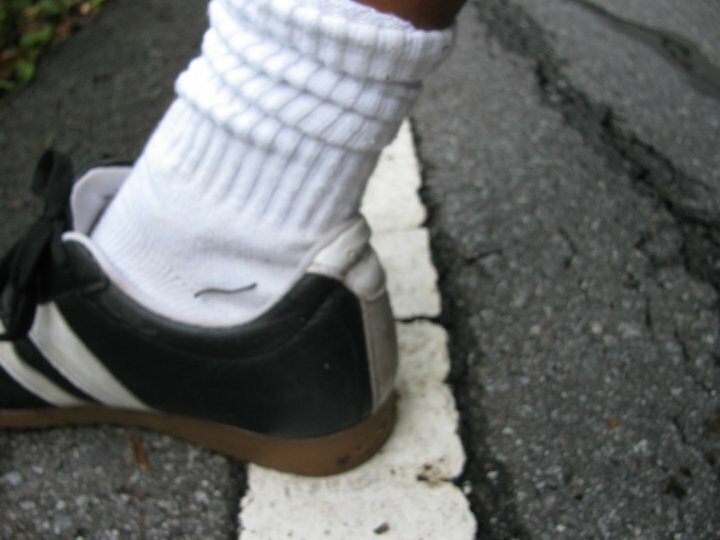 In fact they probably gave the leeches extra time to attach themselves onto stationary socks and shoes. One even got inside John shoe with his foot still in it. Those leeches are sneaky little bastards! Is it safe to jump this month? We did manage to see the waterfall that was used in the Beach. The movie itself was filmed on Maya Beach on Phi Phi Leh, but there is a scene where people have to jump off a waterfall to enter the pot haven. 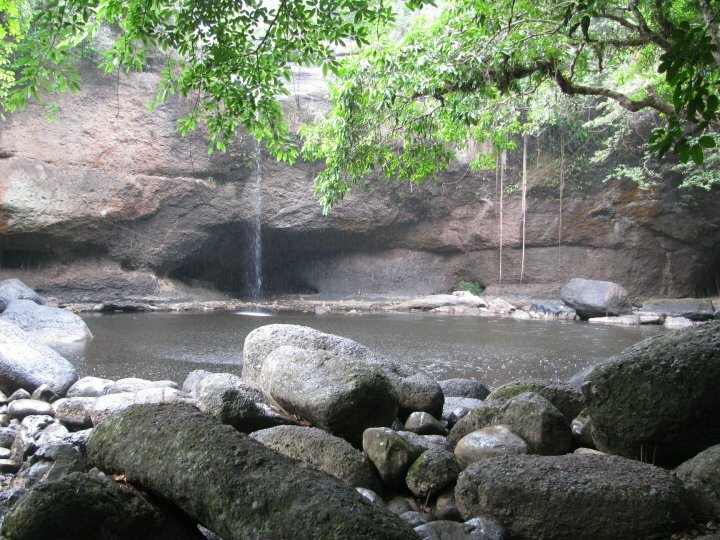 Of course it doesn’t look like the waterfall in the movie or any kind of waterfall because it was the dry season. But, I assure you, this is the spot. To get back to Pak Chong, we hitchhiked. We got into one truck that took us a few kilometers in the direction we were heading. Then we got into the back of another truck. The second truck driver was supposed to take us to the gate, but he never stopped. We thought that he was just being kind and was going to take us all the way to Pak Chong, but then we got on the highway heading towards Bangkok. He forgot that we were in the back of his pick-up! We tapped on his roof, which probably surprised him. “Oh my god! There are a bunch of foreigners in the back of my truck. How did they…. 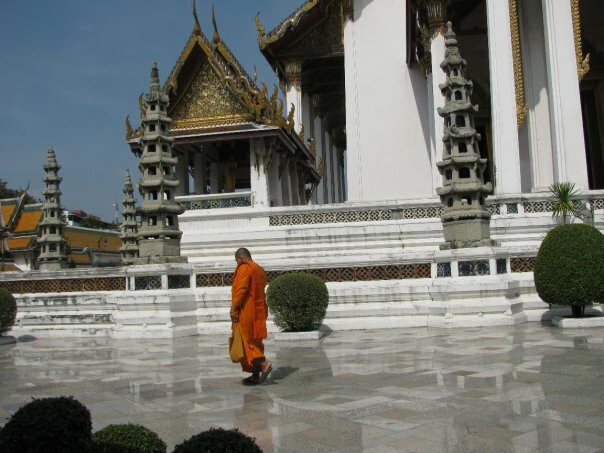 oh right…” He dropped us off at the nearest stop for buses heading to Bangkok. Go to the second floor counter 86 and buy tickets (108THB). The ride is about 2.5 to 3 hours long. The ride is about 2.5 to 3 hours long. Be sure to ask the bus driver to tell you when the bus has reached Pak Chong. 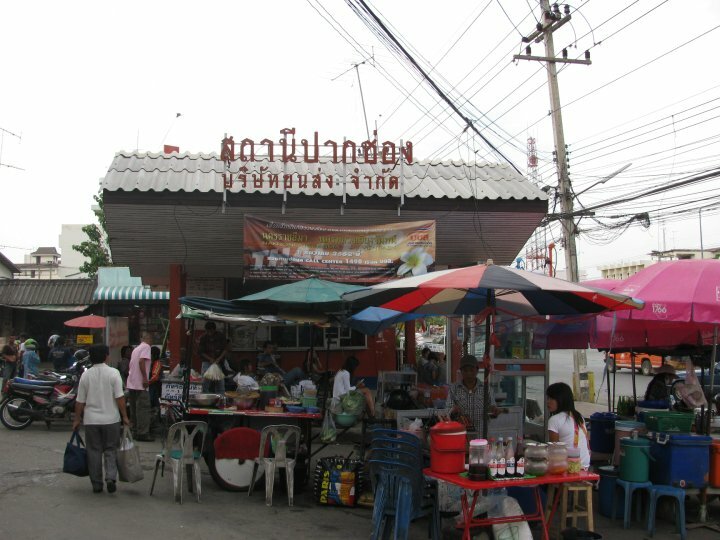 There is no bus terminal at Pak Chong, just a bus stop. There is a stop about an hour or so into the trip where you can get off and use the bathroom. Just make sure that the driver knows you have gotten off so he will wait for you to get back on the bus. The bus stop is not on the map below because I don’t know where it is. I’ve been there, but I can’t find it on the map. There are many ways to get to Khao Yai National Park. It is a very big park that spans many provinces. One way, the way we took, is by first going to Pak Chang. Once you get off the bus from Bangkok, you should head down the street (a left turn after getting off the bus), pass the pedestrian bridge. Take one of the blue songtows to the park. The ride costs about 45THB. Watch out for monkeys, deer, leeches, cobras, porcupines, elephants, and alligators. Though, I didn’t see any elephants, alligators, or cobras. 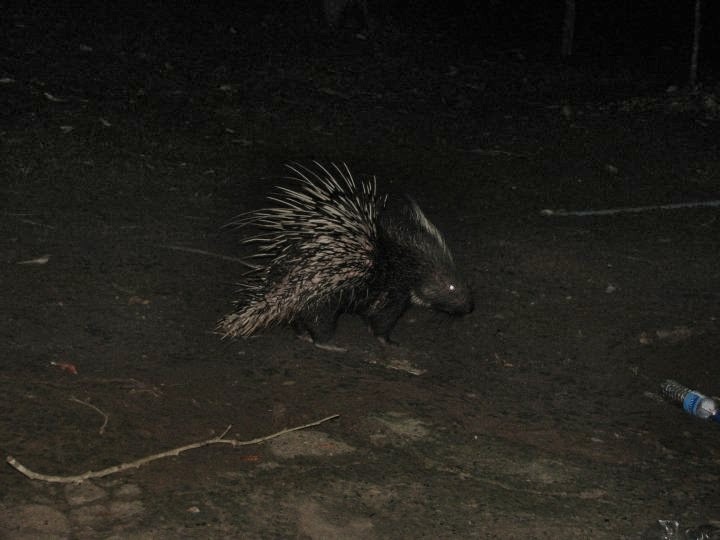 Mark almost walked into a porcupine though. Monkeys tried to steal stuff from John’s tent. We all got bitten by leeches. And there were deer everywhere! To move around in the park, if you aren’t bringing in your own transportation, there are three options. 1. Walk. 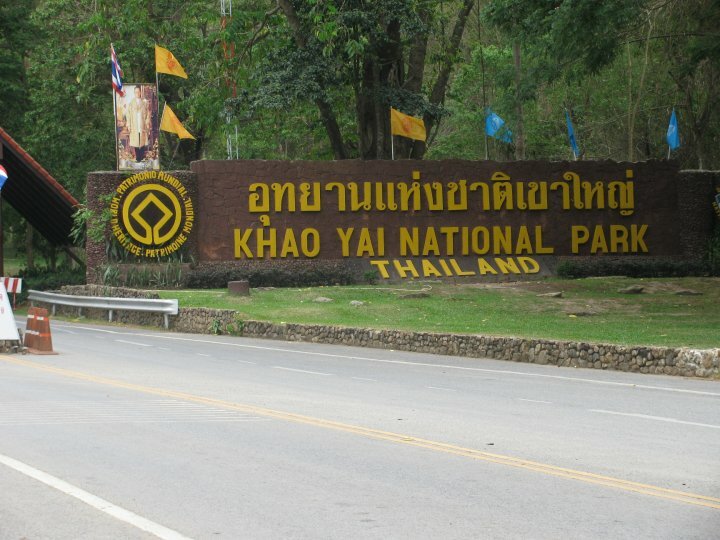 Just remember this is the second largest national park in Thailand and it spans several provinces. 2. Rent a scooter. I saw a guy rent a scooter at the entrance. It cost him about 300THB. Call one of the numbers above for more information. 3. Hitchhike. This is the method that we chose. Make sure you are able to communicate where you want to go before you stop a vehicle. Use a map or have someone write the name of the place in Thai before hand. You are more likely to get a ride from pickup truck drivers than from sedans, especially if you have a large group. 4. You could also hire a taxi or songtow to drop you off and come back in a couple of days to pick you up again and take you to the bus stop or train station. 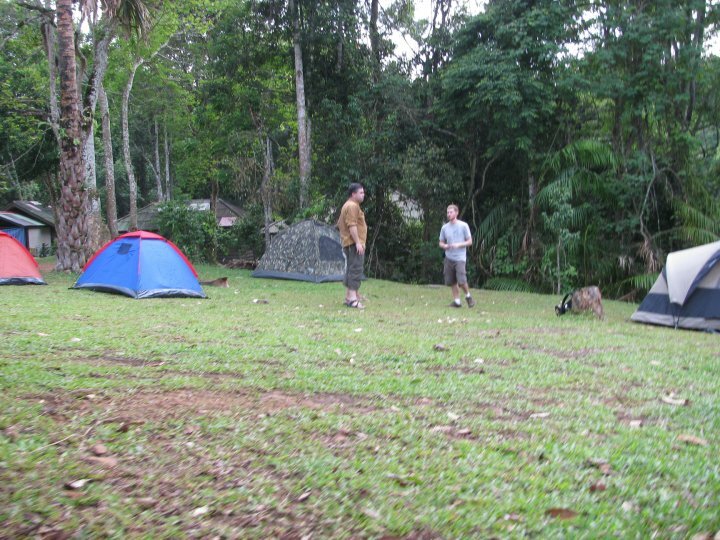 There are at least 2 campsites that I know of, in this park. There were little shops and restaurants near both camp grounds. The ones near our campsite opened at 7:00 and closed at 19:00, but the tent rental place closed at 21:00. 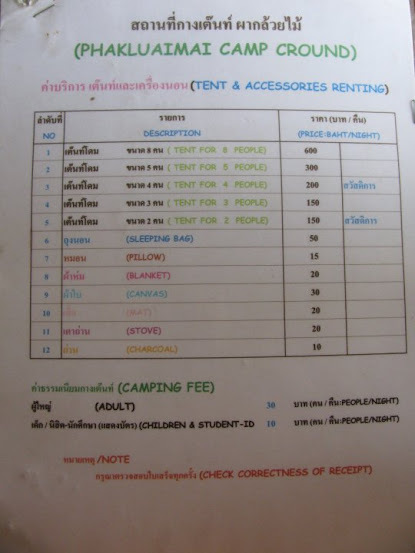 There is a camping fee is 30THB to camp whether you bring your own tent or not. Make sure all your food is properly sealed and put away when you leave your tent so that it doesn’t get taken by monkeys, deer, or ants.